Whenever you select a link in an email, click on a shortcut to a URL or perform any other action that causes a browser to launch, Windows will automatically open the default option. If you've never modified this setting, the default browser is most likely Microsoft Edge. 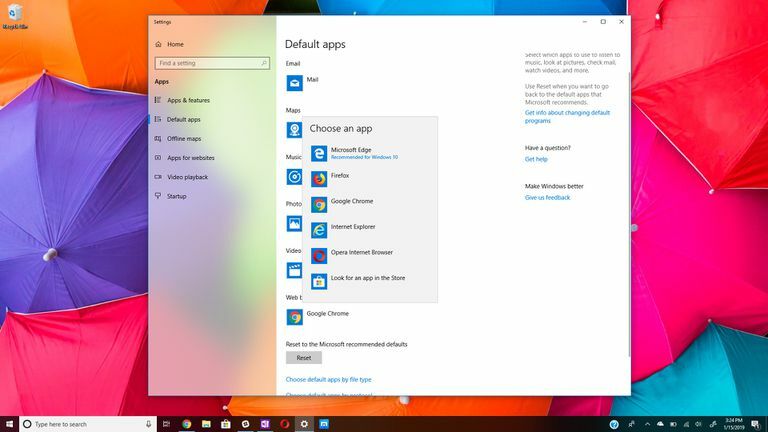 If you're running Windows 10, you might be able to change the default browser quickly, without having to launch any of the specific browser apps, as below. First, try typing "default apps" into the Search field, then scroll down to the Web browser heading. Click on the browser that is already default, and you should see a list of all the browsers available on your PC. Simply select the one you would like to open all your web links, and then close out of the window. If that doesn't work for you, give the following instructions a try, depending on which browser you're running. The following tutorial is only intended for desktop/laptop users running the Windows 7.x, 8.x or 10.x operating system. Please note that all Windows 8.x instructions in this tutorial assume that you are running in Desktop Mode. To set Google Chrome as your default Windows browser, take the following steps. Select the Chrome menu button, represented by three horizontal lines and located in the upper right-hand corner of the browser window. When the drop-down menu appears, select the Settings option. Please note that you can also access Chrome's settings interface by entering the following shortcut command in the browser's Omnibox, also known as the address bar: chrome://settings. Scroll down, if necessary, until you locate the Default browser section. Select the button labeled Make Google Chrome the default browser. Your computer will take you to the Default Apps applet where you can choose Google Chrome as your default browser. To set Mozilla Firefox as your default Windows browser, take the following steps. Select the Firefox menu button, represented by three horizontal lines and located in the upper right-hand corner of the browser window. When the pop-out menu appears, select Options. Firefox's Options dialog should now be displayed, overlaying your browser window. Select the General icon, if necessary. The first section in the General tab, labeled Startup and highlighted in the example above, contains settings related to your default browser. Select the Make Default button. To set IE11 as your default Windows browser, take the following steps. Select the Gear icon, also known as the Action or Tools menu, located in the upper right-hand corner of your browser window. The Internet Options dialog should now be displayed, overlaying your browser window. Select the Programs tab. Locate the first section in the Programs tab, labeled Opening Internet Explorer. Next, select the Make Internet Explorer the default browser link. The Set Default Programs window, part of Windows Control Panel, should now be displayed. Select Internet Explorer from the Programs list — located in the left menu pane of this window. If you would like to choose only a specific set of file types and protocols to be opened by IE11, click on the Choose defaults for this program link. To set Maxthon Cloud Browser as your default Windows browser, take the following steps. Select Maxthon's menu button, represented by three broken horizontal lines and located in the upper right-hand corner of your browser window. When the settings page appears, select the option labeled Set Maxthon Browser as default browser. To set Microsoft Edge as your default browser in Windows 10, take the following steps. Click on the Windows Start button, located in the lower left-hand corner of the screen. When the pop-out menu appears, select Settings. The Windows Settings interface should now be visible. Select Apps. Scroll down until you locate the Web browser section. In this example, you'll notice that Google Chrome is currently the default option. Select the current option to display the Choose an app menu. To set Opera as your default Windows browser, take the following steps. Select the Opera menu button, located in the upper left-hand corner of your browser window. You can utilize the following keyboard shortcut in lieu of selecting the aforementioned menu item: ALT + P.
Locate the Default browser section. Next, select the button labeled Make Opera default. Windows will then take you to the Default apps page and change your web choice to Opera.